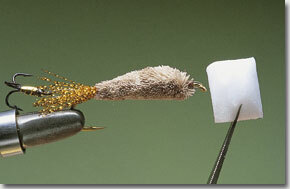 The original surface lures made popular by Hugh Falkus were constructed, rather than tied, from buoyant materials such as cork or goose quill. While these patterns will still catch fish, there are more modern materials available which are also lighter, softer and more yielding and which have a definite advantage over the old ones. 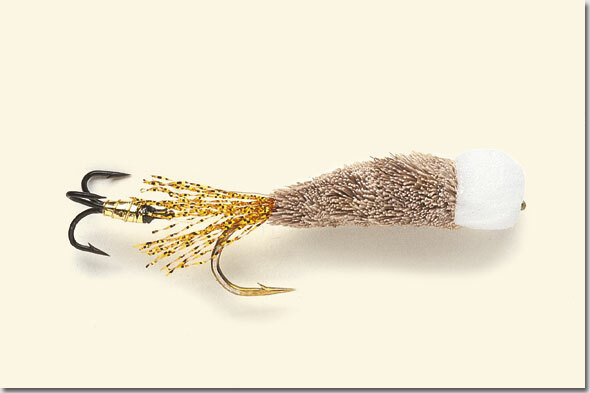 This version of the Wake Lure is tied with a combination of deer hair and foam so that it is not only buoyant but also relatively soft. The result is a fly that is easier to cast and is taken more confidently, which results in fewer missed takes where the fish merely feels the hard body of the fly and rejects it before it is hooked. Even so, most Wake Lures have the addition of a small flying treble projecting from the bend of the main hook — just to be on the safe side. On a dark muggy night seatrout can show a real liking for a fly that makes a big disturbance on the water’s surface. In the right conditions, this style of fishing is extremely exciting and will often produce a big fish when other methods are proving to be ineffective. Though it would seem that colour has little relevance in the dead of night, this pattern is tied in two versions. One has a body of black deer hair and a head of black foam, while the one shown here uses plain, grey hair and white foam. 1. Fix a treble in the vice and run the thread on at the eye. 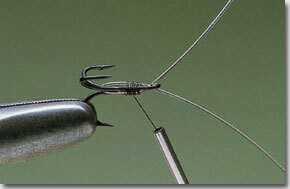 Loop six inches of 20 lb nylon around the back of the hook and feed the ends through the eye. Wind the thread over the nylon. 2. Catch in two inches of gold wire at the bend, then take the thread back to the eye. Now catch in the flat gold tinsel near the eye and wind it in touching turns along the shank of the treble. 3. Wind the tinsel back to the eye. Secure and remove the waste. Rib the body in even turns with the gold wire. Secure it at the eye, remove the excess and cast off with a whip finish. 4. Fix the longshank hook in the vice and run the brown thread from eye to bend. At the bend, catch in the two strands of nylon from the treble. Make sure the treble sits in line with the hook. 5. Secure the ends of the nylon to the entire shank using the thread. At the eye, remove the waste end of one strand but pass the other through the eye and fold it back along the shank. 6. Wind the thread back to the bend in close turns to secure the folded end of the nylon to the shank. Coat the shank of both the hook and the treble with clear varnish or epoxy resin and leave to dry. 7. 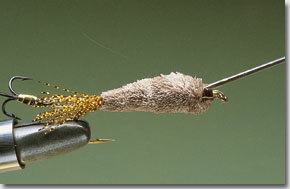 Catch in a length of strong tying thread at the bend and tie in a bunch of gold Crystal Hair or similar to form the tail. Make sure it is long enough to mask the joint between the two hooks. 8. Take a large bunch of natural deer hair and position it at the hook bend with two or three loose turns of the tying thread. 9. Add some further turns of thread and pull them tight. 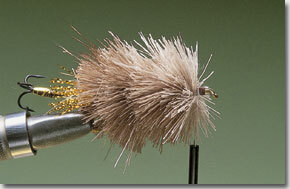 This will cause the hair to flare and spin around the hook to form a dense ruff. 10. Draw the hair back and secure it with thread turns wound directly in front. Add further bunches of hair and repeat the process until over three-quarters of the shank has been covered. 11. 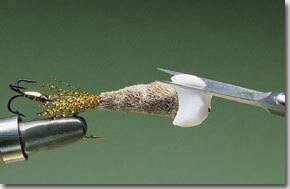 Cast off the tying thread at the eye with a whip finish. Take the scissors and begin to trim the hair. 12. Trim the underside of the hook more than the top so that the point is not masked. 13. Pierce a small square of white foam with a needle. Smear some clear epoxy glue to the front of the deerhair body and the bare hook shank. 14. 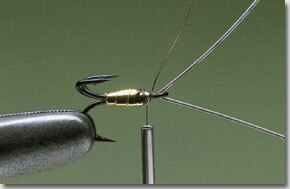 Push the foam over the eye of the hook so that it sits tightly against the body. When the glue has set, trim the foam to shape with scissors. 15. Trim the foam slowly and carefully to form the finished head, as shown here. The Wake Lure is an out-and-out sea-trout fly and, in the right conditions, it will catch fish whenever they run the river, both in pools and in deeper runs where there is enough current to help the fly to drag. This is a pattern to try on an inky black night when sea-trout are prepared to take a big disturbance pattern. Invariably fished on a floating line and a strong leader, the Wake Lure has to be kept moving because, if the disturbance stops for any reason, following fish will turn away. When a fish takes, never strike. Simply let the line tighten before lifting the rod. Failing to do so will result in a missed take. When creating the mount of the surface lure always pass one end of the nylon connecting the treble through the eye of the main hook and then fold it back to prevent the line pulling out. Crimping the nylon with pliers also helps the thread to get a good grip.